Enterprise House will be developed on the site, following on from the completion of the Knightstone headquarters in 2013. 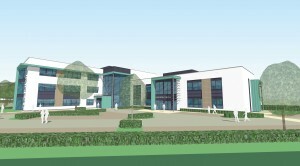 The new 26,000ft² building will accommodate cover 250 people and is currently in fast track planning with North Somerset Council due to its location within the J21 Enterprise Area. A full professional team is in place and the target date for completion of the building is 1st December 2015. Weston Gateway Business Park is situated just off Junction 21 of the M5, 20 minutes from Bristol Airport, 25 minutes to the M4/M5 interchange and has Worle Parkway Train station less than a five-minute walk at the back of the park, with a dedicated pedestrian footpath. Weston-super-Mare is striving to become a centre of business excellence, with Enterprise House at its core. A CGI of how Enterprise House will look in a prominent position, adjacent to Knighstone House and fronting onto the A370, has been revealed by the developers. Designed by Angus Meek Architects, it presents a sophisticated modern building with clean lines and carefully considered detailing – a window on to the world at Junction 21 of the M5 Motorway. Programmed completion is 2015, including fit-out at a BREEAM ‘Very Good’ rating, with a wide range of tenure options available.